Hello and welcome back to The Bluebirds Nest. Today I’m making salmon! If tuna is the chicken of the sea, then salmon is the beef of the sea. Don’t you agree? A lot of friends have told me that they like to order salmon at a restaurant, but they never buy it because they’re a bit afraid of it and don’t know how to cook it. I am here today to answer those lingering questions and restore peace to the hearts of mankind regarding this coral hued terror! Ok, remember the rule about cooking the biggest time sucker-upper first? You should start by peeling and rinsing the potatoes and then cut each one into uniform bite sized pieces. You want them on the smaller side to mash them later. 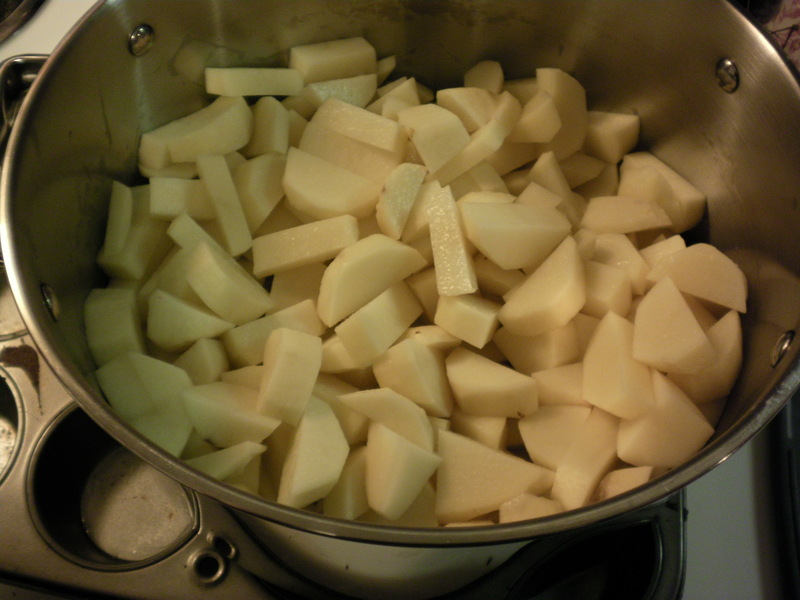 Place the potatoes in a large pot and fill with enough cold water to cover them. You always want to start the potatoes out in cold water so that once the water is boiling, the potatoes only have to boil for a few minutes. They will have been cooking the whole time the water was heating. 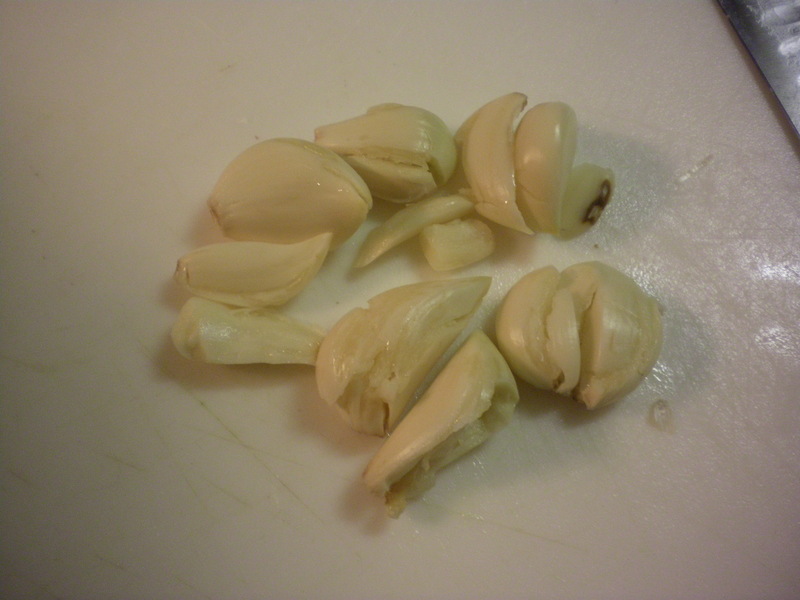 Anyway, before you put them on the heat, smash a few garlic cloves out of their skins with the back of your knife on a cutting board. I use about 5 or 6 depending on the size. I love garlic. Drop the cloves in the cold water with the potatoes whole. As they boil, they will soften and become completely mashable. Once all the veggies are in the hot tub, add a nice handful of salt. It’s really important to season the potatoes before they cook because it’s hard to get enough into them after. 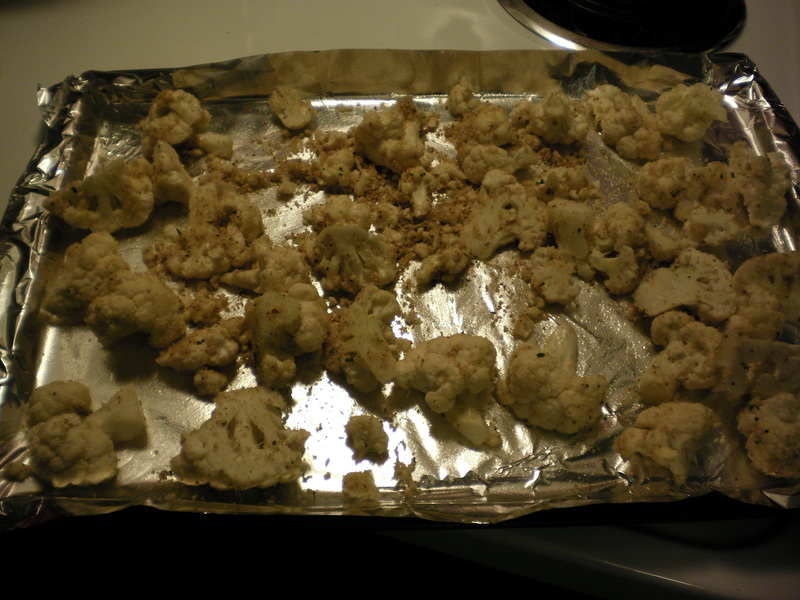 There once was a big strong fireman, who didn’t eat cauliflower at all. He turned up his nose and he curled up his toes and he’d think of a way he could stall. He’d sampled it mashed, and with seasonings dashed but all of it still made him sad. And he knew that nothing could ever be done to make it stop tasting so bad. But one day a bluebird so lovely and fair came to prove that dear fireman wrong. She roasted and toasted and sprinkled it up and tossed it around with some tongs. So that happy man ate the whole dadgum pan and the bluebird just smiled with pride. The End! Don’t you feel better now? The fireman liked it so I know this recipe will convince even the most vehemently opposed to change their tunes. 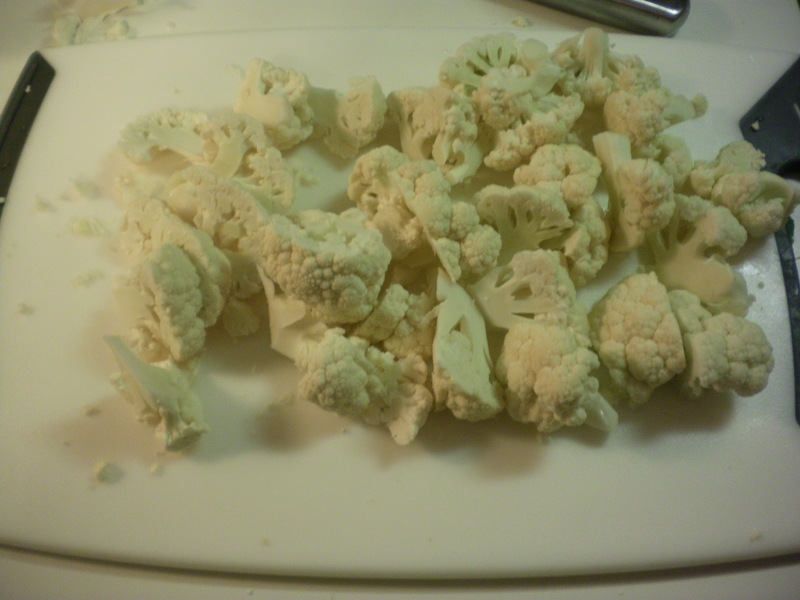 Excellent, lets start the cauliflower! Preheat your oven to 400 and line a baking sheet with foil and coat with cooking spray. Cut the florets off the stalks and then into more bite sized pieces. Place them in a bowl with olive oil (enough to coat), bread crumbs, salt, pepper, and parmesan cheese. Just eyeball all of those ingredients. I trust you. Toss them around with tongs to coat evenly and then dump them on the sheet. Bake them until they are very golden brown and all caramelized. Remove them from the oven and tent them with foil to keep warm. You will be the hero of your very own dinner fairytale! Next comes the “dun dun dun “…. SALMON!! After you’re done shrieking, prepare a second foil lined baking sheet and spray it with cooking spray. Fire up the broiler in your oven. Place the salmon flesh side up on the sheet. Pace back and forth twice. Apply generous amounts of garlic salt, pepper, and dill. 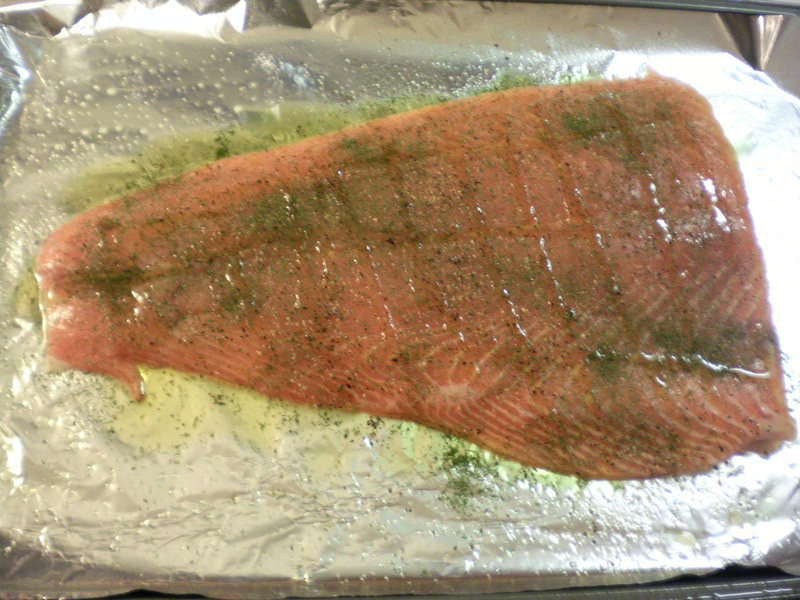 Drizzle (and i do mean drizzle….. not coat, submerge, dollop, or slather) with olive oil and place under the broiler. Leave it under there until it has learned its lesson about intimidating people. You will know when enough is enough because it will be golden and crisp around the edges. This will take about 10-13-ish minutes depending on how hot your broiler cooks. Pull it out triumphantly and tent it with foil to keep warm while you finish the potatoes. Drain them and return them to the hot pot. 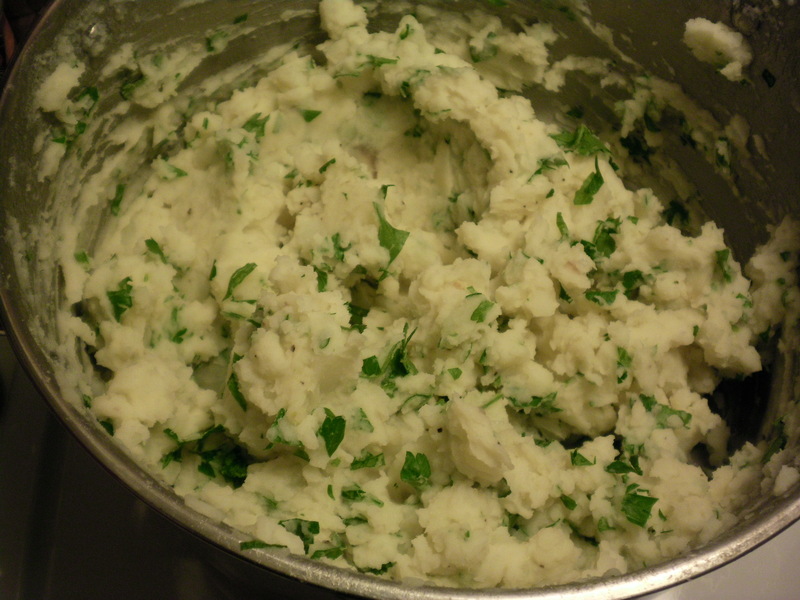 Add some softened butter and alternating amounts of chicken stock and milk while you mash them up with a potato masher. Once you’ve got them to the consistency you like, add salt and pepper to taste and then stir in that chopped parsley. Plate this dinner by placing a mound of mashed potatoes on yer plate. 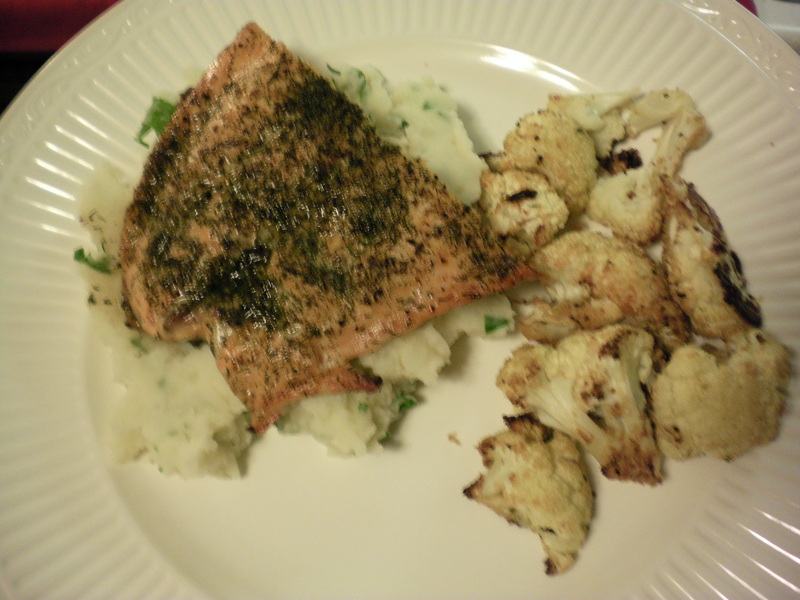 Put a piece of salmon on top of that and nestle some previously misunderstood cauliflower next to that. Such poise, such beauty. Dig in! I hope you enjoy this recipe and that you share it with family and friends. Thanks for stopping by and I hope to see you back real soon!